Well 2014 is almost upon us. So what are you doing now that will help create a successful year next year. Now is the time for you to reflect and assess what you accomplished this year and what went right and what went wrong. I like to do year end assessments of myself and my performance in relation to my goals for the year. What you didn't set goals? Shame on you...LOL. If you didn't set any goals this year then now is the time to start thinking about setting them for next year. There are a lot of people there are a lot of people do not set goals and those are the people that usually remain stuck exactly where they are in life and cannot figure out why they remain stuck. Successful people are the ones who set written goals every single year.That is why it is important to write your goals down because it gives you direction on which you can create an action plan for success. By creating this action plan it gives you a step-by-step measurable guide see if you are on track successfully completing your goal or if you need to make adjustments. Success is also a mindset. You already envision yourself as being a success that you will become a success. If you have doubts you can accomplish any of your goals and become a success then you will not be a success.What you need to do 1st is defined what success means to you. Success mean something different for everyone. For example, a success could mean becoming a great mother and wife. A success to someone else could mean becoming wealthy so they can give back to the community. A success could mean an entrepreneur who wants to start a business to not only support his family but to help other people as well. So defined what success means to you in any area of your life. Maybe you want to get healthier so defined what success means to you in relation to your health. 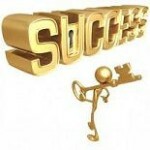 Maybe you want more success in your finances and that means paying off debt and possibly creating more income. Maybe want that promotion at work you are working diligently to get that promotion and to you that could be success. So now it is time to start thinking about next year in starting to write down goals that you want for next year. I also suggest writing down specifically how you want next year to turn out for you. Be very specific as to what kind of success you want and in all areas of your life in relation to your goals. Be as detailed as you want and then start reading this on a daily basis. By reading this and visualizing yourself already having accomplished it you will start to feel the success that you want and that in turn will manifest itself to reality for you. Wishing you a fantastic 2014.